A creative summary defaulted to the current day that shows the performance of all actively running campaigns. A performance widget that shows revenue earned in a set of pre-determined date ranges. Offer Compliance (if applicable), providing links to suppression files and the most recent traffic date and suppression file download date. Top Offers (if chosen to be displayed by the client as a means of promoting additional 'Top' offers). The left-hand navigation bar includes all the tabs affiliates can navigate within, including: Dashboard, Creatives, Reports, Feeds, Account Info and Google Link. Account Manager information will also be visible to the affiliates. The Creatives tab displays all available creatives. The search tool to the left allows you to filter the creatives to search more effectively or narrow the list down to a more manageable size. Active or available creatives can be clicked on to open the offer card and access links, creatives and suppression information. Search options include: name or phrase, storefront, allowed countries as defined by the client, price format (CPA, CPC, etc. 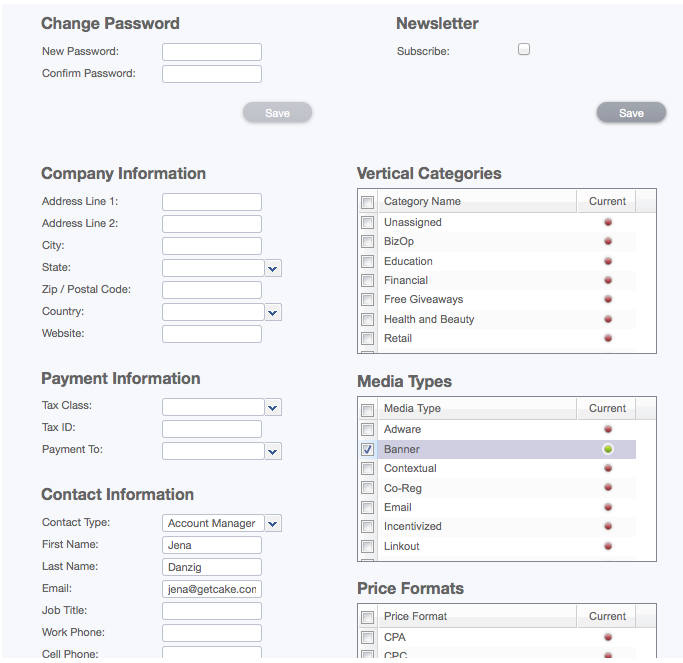 ), status, media types, or payout range. If you are using a different currency than the client, the payouts will display in italic font. Hovering over the payout will show the actual payout in the client's currency. While some basic reports are displayed in the Dashboard, the bulk of the reporting is available in the Reports tab. Subaffiliate Summary: A report aggregating your stats by subID (s1). As stated on the offer card where links can be pulled, the s1 parameter is the only value that can be used to store and group stats. Any additional subID fields can be seen in the click and conversion reports as a reference but cannot be used to group stats. Click Report: A detailed report of all clicks tracked. There is a checkbox in this report to include duplicate clicks as CAKE only displays unique clicks in the summary reports. This section will only be visible to Affiliates if you are utilizing CAKE's Ecommerce tools and have a Product Feed established within the Admin portal. 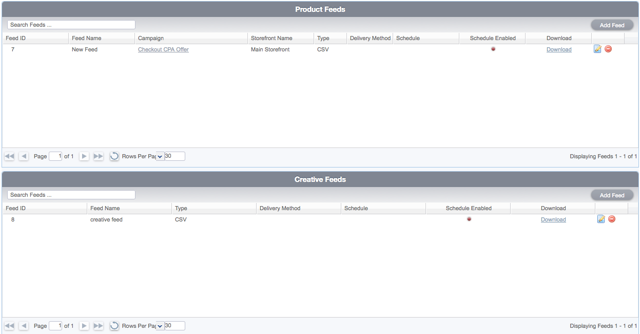 There are two types of feeds that can be pulled as an Affiliate - a product feed and a creative feed. To create a new feed, click the Add Feed button on the far right. The Account Info tab is only visible when logging in with Affiliate contact credentials. For an admin who is virtually logging into the Affiliate Portal, this tab is not available as all the same information can be accessed from within the admin tab on the Affiliate card. For an Affiliate, however, this is where you can modify various fields, including company mailing information and basic payment information, your proficient verticals, and your media types. You can also update your own contact information and your timezone so that you can see your stats reported in your timezone. The timezone feature is available if your client has selected for you to be able to customize, and is contact specific. Exports will still reflect the client's server timezone.